For those who wore an ugly sweater on December 18, they made a fashion statement. For those who ordered a “Fuzzy Sweater” on December 18, they made a difference in the life of design student. AIGA’s Schmoozeday Happy Hours have always been about having a good time and rubbing elbows with some of your favorite designy people. 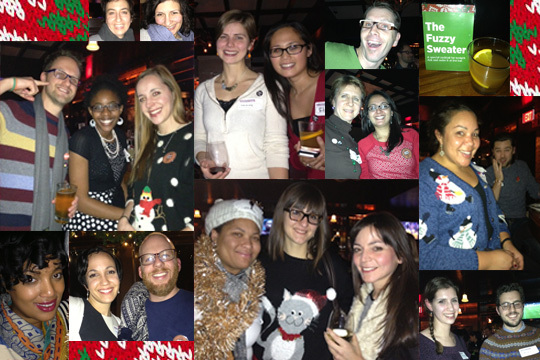 But the 2013 happy hour aimed to help the next generation of designers. When someone ordered their signature cocktail, “The Fuzzy Sweater,” at Brixton’s that evening a portion of the proceeds went to the Design Continuum Fund—a scholarship for students whose talents exceeded the size of their bank accounts. For those who weren’t sure about ordering a cocktail on a school night could still donate to the cause. They just had to see a Design Continuum Fund member or AIGA board member to donate via an onsite iPad or with cold, hard cash.